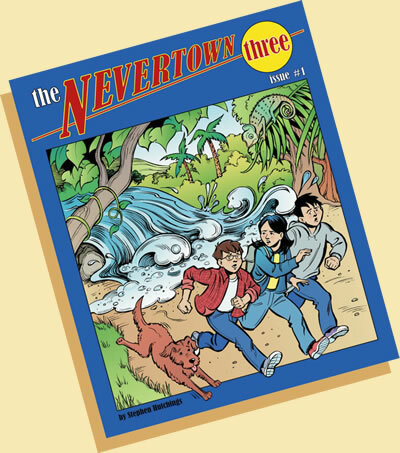 The standard english version of the Nevertown Three is perfect for young readers whose first language is english, and already enjoy reading on their own. Packed with colourful illustrations and action, the story is aimed at the Grade 4 and 5 levels, but of course, as an adventure story, will appeal to children on either side of this demographic. Teachers who have reviewed the story have told us that this form of story telling is perfect for that in-between age, and that the Nevertown Three book is not too simple, with a contemporary, age appropriate subject/adventure. The Story – In a new town at a new school, brother and sister Jamie and Kate are having trouble fitting in. After Matt, one of the school trouble-makers, finds Jamie’s secret lab in the school basement, a strange old telephone buzzes with a message for help- and the three embark on an exciting adventure into the distant past. As well as the adventure, young readers will enjoy the sometimes lively exchanges between Kate and Matt, and the clever way Jamie solves the mystery.